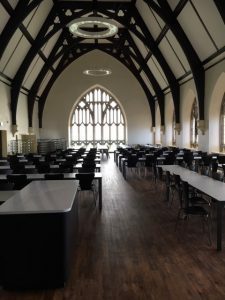 Kitto Construction was appointed by Clifton College to refurbish internally and externally their existing three-storey Grade II listed BSK building, Clifton constructed in 1860. Works comprised a refurbishment of the internal spaces including the Catering and Dining areas and existing staff rooms, office and toilet facilities. The existing steep pitched slate roof with scalloped features in contrasting slate was also refurbished. The existing slates, felt battens and straw insulation between the rafters was removed and temporary protection provided to maintain water tightness. The feature dormer vents were overhauled with new timbers and the leadwork replaced to parapets and abutments. The roof was re-covered with new insulation, felt, battens and new purpose made Welsh slates to match the existing. The work was undertaken without a temporary roof to reduce cost on the project. Whilst the scaffold was erected, repairs were also undertaken to the existing stonework and windows. A new lift shaft and passenger lift was also provided, as the existing lift was non DDA compliant. The work was undertaken within 3 phases, with the first phase (the enabling works) completed during the School Easter holiday and the second phase during the School Summer holiday with completion by the start of the Michaelmas term. The third phase is to be completed by Christmas 2018. 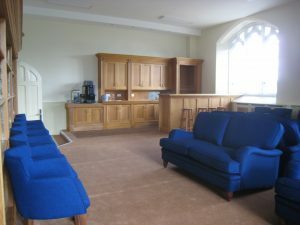 Certain rooms were also provided earlier than this to allow the School to be operational by the start of term. 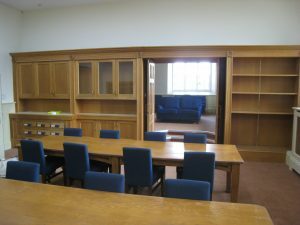 Access was also provided to Clifton College’s IT direct contractor to undertake their own installation during the construction works. During the third phase the College arranged for temporary portable buildings and a marquee adjacent to the BSK building to provide temporary kitchen and dining facilities. Kitto were involved early in the project to provide cost and programme certainty for the school and assistance with product selection and buildability. This allowed Clifton College to progress with the project knowing that the scheme was affordable and deliverable. A number of design changes were also introduced into the project at a late stage (during construction) which Kitto using their expertise ensured did not impact the overall completion date. The building is located within the middle of the school opposite the Quad / school courtyard, and works had to be undertaken to ensure the continued operation of the school and maintain strict safeguarding requirements. To achieve this, Kitto created a segregated access into our site to prevent the school coming into contact with the construction works. Weekly meetings were also held with the Estates Bursar, to ensure the construction works minimised inconvenience to the school. This BSK building is very precious to the College due its history and origin of the school so Kitto were delighted to be entrusted with their most prestigious and important project. The works were undertaken on a JCT Design and Build Contract with Kitto delivering the project on a turnkey basis supported by the Architect, Nicholls Brown Webber; Structural Engineer, TM Ventham; Building Services Engineer, MEP and their supply chain partners.